We have been heavily involved in Diabetic Eye Screening in Havering for over 20 years. We offer this at both practices 6 days per week, using the latest digital photography and OCT imaging systems. Our highly qualified Optometrists and Screeners are able to carry out more specialist retinal screening such as “SLIT LAMP SCREENING” and “DIGITAL SURVEILLANCE”. This is through our dedication to training and investment in the latest equipment. We are heavily involved with the official NHS Retinal Screening programme in Havering. 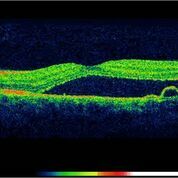 OCT scanning for sub-retinal fluid which can be the pre-cursor to Wet AMD. We can communicate and urgently refer directly to the NHS Ophthalmology department. Yearly screening for Family History of Glaucoma. We are now part of an official “Stable Glaucoma Monitoring Service” which we are in partnership with local NHS Ophthalmology departments.